WILLIAM ST. JOHN GLENN R.U.A (1904-1974). William St. John Glenn was born in Belfast. As a boy at school during the First World War, he was drawing battleships in action with guns blazing, and at 16 he had his first drawing reproduced in Ireland’s Saturday Night. This early success redirected his studies away from medicine and firmly to art. As a first step to gaining experience, he entered the Artists’ Department in a small publishing house, Graham & Heslip Ltd and for over five years illustrated countless booklets, did figure sketches in black and white and colour, and show- card and advertisement designing. Towards the end of 1926 he started free-lancing cartoons for newspapers and had drawings published in the Belfast Telegraph and the Irish Daily Telegraph, Judge, The Passing Show, London Opinion, Dublin Opinion, Radio Times and Scout. Individual cartoons became a “Strip cartoon” when from May 1926, at the age of 21, William St J. Glenn saw his own strip cartoon called “Oscar” appear daily in the Belfast Telegraph. “Oscar” featured a little man with a long nose who wore the baggy trousers of the period known as “Oxford Bags.” In August The Belfast Telegraph appointed him to the Editorial Staff. He became an expert in the making up of composite pages, adding artwork and writing suitable captions. It was in this same year at a Halloween Party that he met his future wife, Dorothea, and soon his strip cartoon character “ Oscar” had a glamorous wife inspired by the real person. "Oscar" was subsequently syndicated in South Africa and Australia. While with the Belfast Telegraph he became a Member of the Institute of Journalists, and wrote his own column on topical subjects. He also had the opportunity to be involved in experimental press photography and was responsible for doing the touch up of photographs, particularly official persons and dignitaries. There is no doubt that Dorothea was a very attractive woman and remained an inspiration to William St.J. Glenn throughout his life as an artist. In 1929, Pears Soap organized a competition to find the "Most Charming Woman of Ulster" and Dorothea who received her prize in London won it. Another artist who found Dorothea attractive enough to ask to paint her was Frank Mc Kelvey R.H.A. He painted her life size portrait in water colour. Dorothea was a cousin of the famous Brontes. Her great-great grandfather was William Bronte, the Reverend Patrick Bronte's brother. William and Dorothea married on June 3rd 1930 at Belfast Cathedral and the crowds of spectators in the photos made this look very like a film star wedding. The Ulster Academy of Art. In 1931, he was elected member of the Ulster Academy of Art and in 1936 elected full Academician and Vice-President. In 1931 the first exhibition of the Ulster Academy of Art was opened in the Municipal Art Gallery, Belfast.Glenn exhibited two watercolours and over the coming five years, he exhibited watercolours, oil paintings, an occasional black and white sketch and even, unusually, pencil sketches. His subjects varied from portraits and landscape to markets, a printing press and Gipsy scenes. He also exhibited in the R.H.A exhibition in Dublin in 1936. Glenn was happy to talk to community groups about his work and enjoyed organising the annual Ulster Arts Ball which involved the community in a lot of fun dressing up for prizes. He was elected an honorary academician of the Royal Ulster Academy in 1968. 1932. Illustrated "John 0' the North"
1931-1934. Wiliam St. John Glenn was also doing another strip called "Simple Simon" in "Ireland's Saturday Night." In 1935 He was contributing work to ''The Modern Girl" magazine. Dublin Opinion” was a humorous monthly magazine established in the early days of the Irish Republic and William St John Glenn was contributing cartoons from 1928. He signed his work William St John (with a lozenge shaped O). Over the next forty years he contributed cartoons often portraying glamorous, sophisticated young men and women,but alongside these, from 1938 he produced a full page scraperboard drawing of country folk in a mythical village called "Ballyscunnion". He used a scraperboard covered in white china that could be inked black and scratched, giving an effect rather like a woodcut. "Rarely can the medium have been more brilliantly used said Charles E.Kelly, the editor of Dublin Opinion. On Monday 31st August 1936. The Daily Mail announced a new comic strip that would run daily and start the next day. It was called "Dorothea'' and featured an attractive young woman inspired by William St. J. Glenn's wife. He started supplying the "Dorothea" strip while still with the Belfast Telegraph, but when the Daily Mail were sure of the success of “Dorothea”, William St. J. Glenn and his family moved to London. Within six months he joined the staff of the Daily Mail. The “Dorothea” strip attracted favourable attention from the art world for its experimental layout and from women readers for the style of clothing. It continued until the growing threat of war forced major changes in newspapers in the Spring of I939. "Dorothea” was syndicated to The Friend in South Africa in 1937 and also appeared in Australia and Scandinavia. 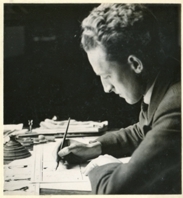 During the next year William St. J. Glenn stayed in London freelancing cartoons and illustrating articles for many London newspapers and magazines. Then after recovering from major surgery for a brain tumour in 1940, he joined the Ministry of Information, working in the photographs and pictures division. Back to The Daily Mail and "Teddy Tail". With the coming of peace,William St J. Glenn returned to the Daily Mail as Features Editor. He initiated the Strip Cartoons Department and commissioned artists and photographers. He continued as an artist contributing illustrations to the Daily Mail Annual for Boys and Girls and designing covers for the Teddy Tail Annuals. 1951 brought new worries. After another brain operation, William St. J.Glenn returned to the Daily Mail to draw "Teddy Tail" daily for the newspaper until it stopped appearing in 1960. The Daily Mail also introduced a ""Blue Spot" Annual of Children's Favourite Stories." Three editions of these annuals were produced (1957,1958 and 19599) and William St. J. Glenn designed the covers for all three and illustrated some of the stories in each. Retiring from the Daily Mail after more brain surgery in 1961, William St. J.Glenn devoted some of his leisure to helping the Chelsea Cine Club, and writing articles on Chelsea’s riverside, illustrated by photos. There was an exhibition of original Ballyscunnion scraperboard drawings in the Irish Club, Eaton Square, London.The exhibition was opened by Sir Charles Petrie, military historian, and the editor of Dublin Opinion, Charles .E. Kelly flew over from Ireland to be there. He suggested the collection should find a home in the "National Gallery" in Dublin because "I am sure the like of this will not be seen again." William St. John Glenn died in hospital in Chelsea in June1974.